We have so many fun and exciting challenges going on this year at SBAMQG that I wanted to write up a quick blog post to tell you about them so you have somewhere to reference all the fun! 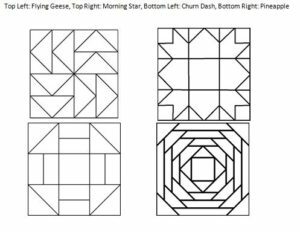 Our next challenge will be to take one of the traditional quilt blocks pictured below and recreate it using modern quilting elements. Finished quilts can be any size. 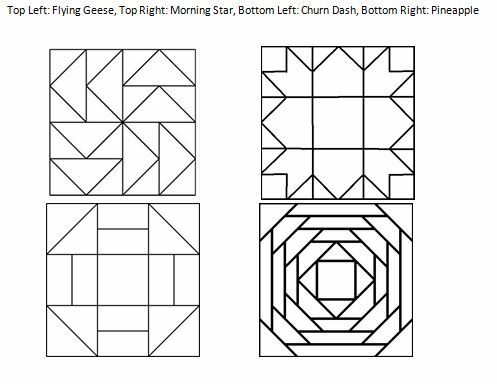 Guidelines: Quilts must be finished by the December meeting and will be displayed at the 2018 PVQA Quilt Show. All quilts must be submitted with a 4” wide hanging sleeve stitched to the back. Quilts should be labeled using the official PQVA label. All quilts must be finished (quilted and bound); no tops or partially finished quilts will be allowed to hang. No more than two entries per member. **Edit: The Morning Star Block is also known as the Weather Vane Block. We always enjoy the quilts our members make, but are especially excited to see the WIPs you finish this year and the challenge quilts you dream and stitch up! Where can we get the official label for the entry for PVQA entry?